Former Vice President for University of Arizona Global Initiatives (OGI), Mike Proctor, has received the prestigious Manuel T. Pacheco Award from the Consortium for North American Higher Education Collaboration (CONAHEC). 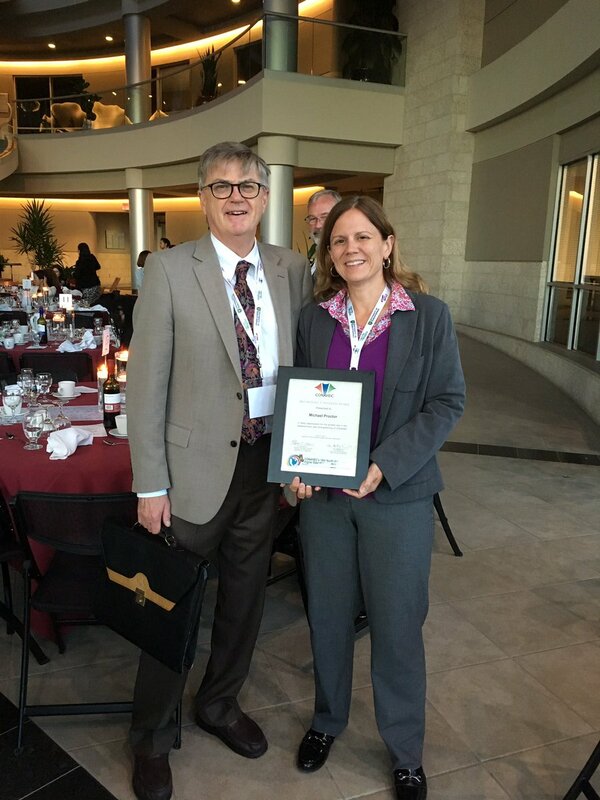 Granted at the organization’s annual conference in Regina, Canada, Interim Vice President for Global Initiatives at the UA, Suzanne Panferov, accepted the award on his behalf. Proctor served as vice president for Global Initiatives, starting in 2009, before which he worked as a university attorney, the assistant vice president for corporate relations and as associate dean for external affairs in the College of Agricultural and Life Sciences. He also served as dean of the Outreach College, managing the UA’s distance education and branch campus programs. Having recently retired, Proctor molded a career based on building collaborations that transcended countries between academic institutions and other organizations. Under his tenure, he helped create a supportive base at OGI for CONAHEC, promoting its core mission of connecting higher education institutions from Canada, the United States, Mexico, and beyond. Proctor also served for four years as a member of the CONAHEC Board of Directors. The Manuel T. Pacheco Award, named after the distinguished former UA President, acknowledges his work in promoting CONAHEC and its trilateral educational focus. Proctor was specifically honored for making an outstanding contribution to the development of higher education opportunities in the Americas. Since assuming leadership of OGI in 2009, and up until his recent retirement, Proctor oversaw an increase in international faculty and scholars to the UA from fewer than 800 to more than 1,500. He facilitated growth the number and breadth of study abroad and student exchange opportunities, with the UA currently operating 130 programs in more than 60 countries. Proctor also spearheaded the increase of international students at the UA from 2,585 in 2010 to approximately 4,000 today. He was also instrumental in establishing a UA-based presence for the Universidad Nacional Autónoma de México, Latin America's largest university. The center, known as UNAM-Tucson, builds on a longstanding partnership between the two institutions and promotes academic relationships and research opportunities between the U.S. and Mexico. For more information about OGI and its current initiatives, please visit https://global.arizona.edu/. For current CONAHEC projects, please visit https://conahec.org/. UA Global advances opportunities expressing the UA core mission elements of opportunity, innovation and impact on a global scale.